A successful licensed comic takes advantage of the comic-book medium to offer a different take on an established film, television, video game, or toy property. All too often, licensed titles default to bland replication of the source material, which is a logical decision. These books are intended to appeal to fans of those properties, so it makes sense to stick close to the formulas that made the properties popular. Mighty Morphin Power Rangers was popular because it was targeted to children that gobbled up the bright superhero costumes and giant dinosaur robots and weren’t bothered by the shallow storytelling, stereotypical characterizations, and laughable production values. 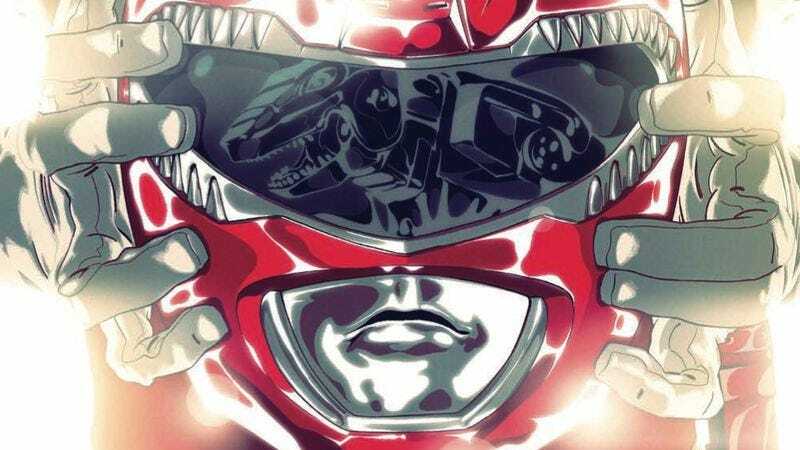 The new Mighty Morphin Power Rangers #0 (Boom!) is appropriate for all ages, but its target audience is the nostalgic adults who grew up with the TV series. Writer Kyle Higgins expects readers to be familiar with the Power Rangers and their enemies, offering little exposition despite this being issue #0. Granted, the concept and characters of MMPR are so simplistic that Higgins doesn’t need to spend significant time explaining them, but the fact that he chooses not to shows that he anticipates his audience already having that knowledge. As a story for adults, the main story by Higgins, artist Hendry Prasetya, and colorist Matt Herms is a disappointment, and while it sticks to the Power Rangers basics, those basics don’t make for especially riveting narratives. Rita Repulsa sends a monster to attack the Power Rangers, they assemble the Megazord to fight it, and learn some kind of lesson in the end. Higgins introduces some tension with the Green Ranger’s internal fight against Rita’s evil influence pushing him to betray his new friends, but that conflict doesn’t have much weight because Tommy’s relationship with the rest of the group has so little definition. The strongest element of Prasetya’s artwork is the design of the Power Rangers in their civilian identities, and he uses clothing to reflect personality in way that is stylish and specific. But once “Morphin’ Time” comes around, the visuals begin to dip. The Power Rangers and their Dinozords are all depicted in clean detail, but the figures are very stiff in action. There’s also not very much action; the Power Rangers don’t fight hand-to-hand or with their individual Zords, jumping immediately into the Megazord to finish their enemy off with Tommy and the Dragonzord’s help. The internet has allowed more small press publishers to enter the fray of the comics industry in the last few years than we’ve seen in a very long time. The bar for entry into digital-but-not-web-comics is lower than ever, and it means that readers have access to an even wider swath of stories and talent. Janelle Asselin’s all-digital Rosy Press, founded with a Kickstarter for the much lauded Fresh Romance series, has had the benefit of some incredible talent to work with. Names like Kevin Wada, Marguerite Sauvage, Babs Tarr, and Kate Leth all but guarantee some level of success, and with a market starved for romantic comics it’s no surprise Rosy Press has continued to branch out. One of the first forays into a non-Fresh Romance title, Beauties #1 (Rosy Press) offers a retelling of the classic “Beauty And The Beast” tale. Writer Marguerite Bennett, who is vying for her own spot on the list of busiest creator in comics, takes a story traditionally told about fear and fate and refocuses on love and acceptance. Rather than gussying up what is at its center a pretty terrifying tale of isolation, Bennett choses instead to show the ways in which love can make people better, stronger versions of themselves, even when faced with anger and hatred. It’s a kind but stern and difficult message that would fit in perfectly along with books like Mercer Mayer’s East Of The Sun And West Of The Moon or Jan Brett’s own version of Beauty And The Beast, treading on classic themes from familiar stories like The Labyrinth or The Princess Bride without feeling stale. Further cementing the nostalgic feeling, artist Trungles’ style looks like it could have come from an art deco style book. There’s something slightly Little Nemo about it, or perhaps David Palladini; the character and their costumes are lush and well defined. Trungles excels with motion, particularly when it comes to fabric and hair, giving panels a kinetic spark that a lot of other books are missing without losing any sense of grace or poise. The book’s main pitfall is with the coloring in this issue, or lack thereof. There are plenty of examples of his work that has rich, layered textures online, but the coloring in Beauties #1 feels flat in comparison and even more so when contrasted with Kris Anka’s stellar cover. Trungles’ art is sweet, stunning, and full of beautiful details, but the coloring does it a disservice by foregoing shading and more texture. Tangentially connected to the same macro-series of interrelated titles as 8House: Arclight and From Under Mountains, Emma Ríos and Hwei Lim’s Mirror #1 (Image Comics) features machinations similar to those of its sister series. The book occupies that DMZ that separates science-fiction from fantasy, and the world of Mirror is populated by wizards and conjurers. It takes as its leads a rat person, a dog woman, and a human wizard, but Ríos and Lim deftly keep them at arm’s length. Their wants and desires are only ever hinted at, and the book takes great pains to conceal any information that isn’t immediately necessary to understanding the scene. Ivan, the human wizard, is glimpsed as a young boy in a prefatory narrative, and as he and Sena—the dog woman who he comes to love—grow up, they are drawn into some unseen conflict. This conflict undergirds the drama of Mirror, and Zun, the rat person whose contorted body graces the cover of this first issue, is sent off on a related mission whose finer points will reveal themselves later. The details are scarce, understated, and only ever alluded to. Zun knows their mission, of course, but the reader is left to wonder. This obfuscation is indicative of one of the more compelling aspects of the issue, namely that of an absence. Mirror is noteworthy for the unspoken, as opposed to the spoken. This isn’t, however, an attempt to game the reader. It’s clear that Ríos and Lim aren’t withholding for the sake of a twist à la The Usual Suspects. There is simply an omissive quality that runs through Mirror #1, an understanding between characters. They speak in whispers, in circumspection; they speak with an assurance that not everything they say needs to be unpacked and exposed. In this way, Mirror treats the reader like a diegetic observer and a part of the narrative (as opposed to the way readers are commonly treated: like foreigners, people unaccustomed to the language and behaviors of a place). He-Man And The Masters Of The Universe were introduced in 1982. Although by modern standards the toys may look primitive and blocky, with only five points of articulation and body parts reused from a single mold across most of the line, back in the first Reagan administration, He-Man was the best game in town. Kenner’s Star Wars line had revolutionized the world of boys’ toys, but He-Man was a new property. It wasn’t beholden to an existing movie franchise. The Masters Of The Universe towered over Luke Skywalker by almost two inches and were unhindered by the limitations of representing (mostly) flesh-and-blood actors. He-Man and his brethren were pure plastic id, garishly colored heroes and monsters inhabiting a fantastic world of pseudo-medieval barbarians and cosmic sci-fi. Of course they flew off the shelves. One of Mattel’s great innovations in marketing The Masters Of The Universe line was the inclusion of minicomics with each toy, usually designed to introduce the toy to its new owner. These comics weren’t very good. They were written for an audience of very young children, which meant that there were definite limits to how much violence could be shown. The art, even when produced by seasoned veterans, was hampered by the limitations of the format. And yet, despite all that, there’s an undeniable charm. The He-Man And The Masters Of The Universe Minicomic Collection (Dark Horse) reproduces each of the original minicomics from the original Masters Of The Universe, She-Ra, and New Adventures of He-Man toy lines, along with the handful of comics produced for subsequent toy relaunches, 68 in total. For anyone who didn’t grow up with He-Man, there’s probably little to recommend here. Despite the presence of numerous notable creators—folks such as Alfredo Alcala, Mark Texeira, Bruce Timm, Christy Marx, Steven Grant, Carol Lay, and Stan Sakai—the merits of the comics themselves are few. But for anyone who retains the slightest fondness for He-Man and his world, Dark Horse has done an excellent job in representing these strange stories. Reproduced slightly larger than the original printings, and complete with scholarly footnotes (! ), it’s hard to imagine a more loving tribute to these odd artifacts. The creator interviews scattered throughout the volume are mostly interesting for how little they reveal: most creators, even those with fond memories of the project, remember little about the production. To a person none of them imagined anyone would remember these little books, let alone that they’d still be signing dog-eared copies at comic-book conventions 30 years later. But at their best these stories do a good job of approximating the random energy of very young kids telling their own stories with toys. He-Man remains a wonderfully elastic concept, fantasy and sci-fi strewn together with little heed for internal logic.